Istanbul Modern’s partial retrospective of one of Turkey’s greatest modern artists is as bold as the man himself. Works comprising paintings, sketches, sculptures and ceramics from the past 50-odd years are displayed, together building an exhaustive picture of Mehmet Güleryüz’s stellar career and true talent. The museum’s director, Levent Çalıkoğlu, himself took on the all-important curating duties, and he’s done a fine job. The temporary exhibition halls have been left almost untouched – open and spacious – allowing Güleryüz’s large-scale paintings to really shine. 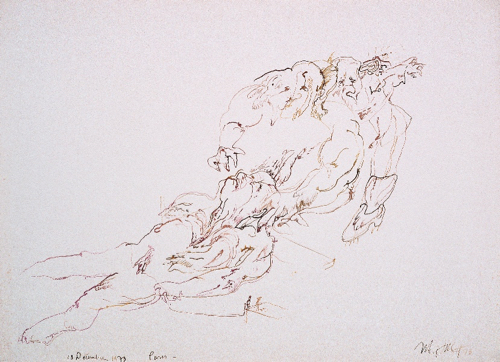 There are almost 150 works on display, mostly paintings, but also some sketches, a few sculptures from the 1970s onwards, as well as examples of his ventures into theatre and performance. And for diehard fans there are also multimedia screens projecting some 200 drawings. The big theme Güleryüz covers in his oeuvre is Turkey’s socio-cultural and political transformations and their effects – and he explores this in smaller themes such as family, social conditions, socio-economic and environmental factors, the nature-human relationship (people’s helplessness in the face of nature, to be precise) and class struggles. His contemplations on people and their roles in society possess a realness, and thanks to his keen eye, his works hone in on humankind’s existential concerns, portraying a range of emotions: agitation, anxiety, bewilderment, expectation, melancholy, defiance... Güleryüz confronts society’s most pressing issues while simultaneously projecting the transformations he himself has undergone. 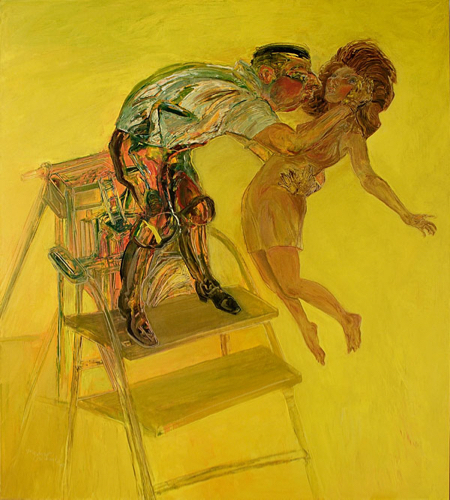 Painting, for him, does not happen in a bubble – it is at once very personal and universal. Güleryüz was born in Istanbul in 1938 and enrolled at the Istanbul State Academy of Fine Arts in 1958, where he studied in the department of painting. 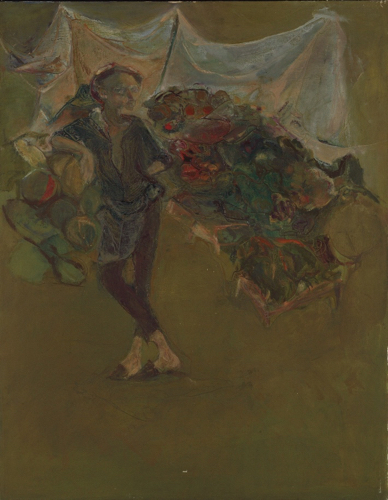 He was also interested in acting and became involved in various actor’s studios and important amateur theatres during his uni days – and the connection between theatre and visual arts is a theme explored in this show. 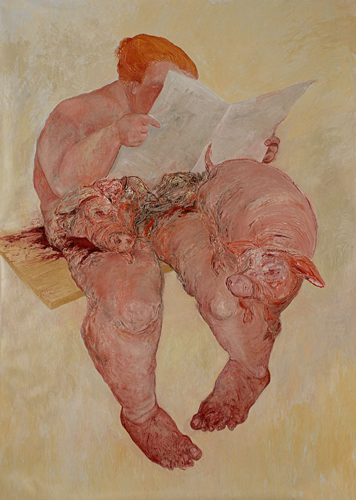 It was during this time that Güleryüz created the first examples of his skinless figures, which derived meaning from half-grotesque Expressionism. 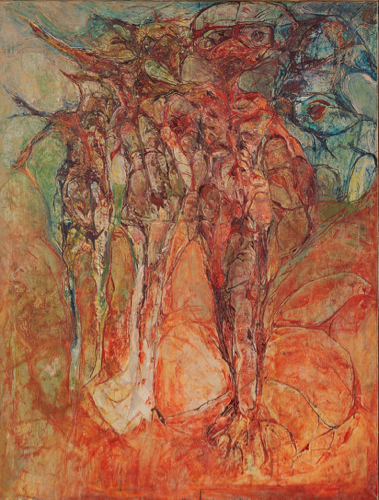 His works, ‘Dancer’ and ‘Three People in Nature’, both from 1965, were quite different in style from the way he was taught at the studio of Neşet Günal, a prominent painter at the time – a studio dominated by the classic representation of the human form. Instead, Güleryüz fictionalised a human figure using an energetic drawing line and worked out the details as he painted, a bold move in those days. For the artist, these figures became a way to understand the changing Turkey of the 1960s: a time characterised by an increase in urbanism, a time with an uncertain future, a time riddled with existential anxiety. Güleryüz’s understanding of people and their roles in society can be seen even in his early paintings, as the ‘Manav’ (‘The Greengrocer’) demonstrates. The manav has the confident stance and air of a tough local youth, rather than that of a street peddler. The inconspicuous fruits and vegetables on his stall allow our attention to focus on the man himself, rather than his occupation. Thus he subverts his expected class and rank not through the quality of his work, but through his atypical personality. Güleryüz graduated from the academy, in first place, in 1966. Two years later he produced the painting ‘Side-Show Tent’ for a competition, the prize for which was a place on the wall of the national opera house. 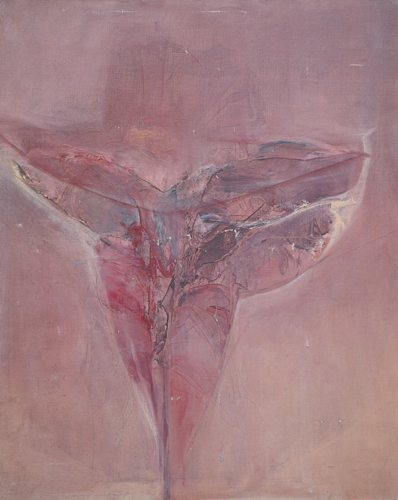 ‘I made the painting [for the competition], but I knew full well that a painting evoking a sexual phantasm of such sorts wouldn’t be exhibited in the foyer of an opera house,’ writes Güleryüz on the plaque next to the work. In 1970, Güleryüz won the European Contest held by the Ministry of National Education, for his work ‘Trolleybus Conductor’. He was awarded a four-year scholarship at the École de Beaux-Arts in Paris, where he went on to study painting and lithography. 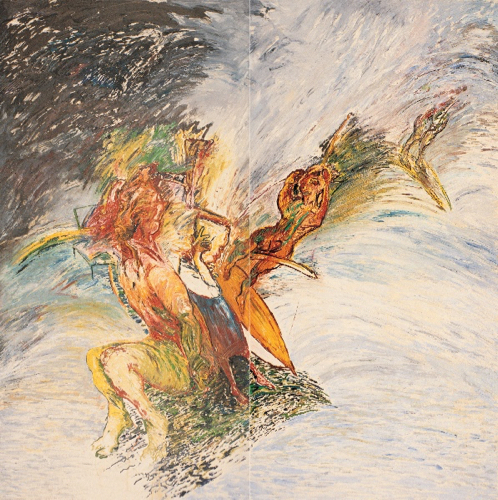 Güleryüz recounts the story of this painting: ‘It was the winter of 1970. On a dreary and rainy morning, I got on a trolleybus from Bebek to go and do the scholarship exam…The trolleybus conductor… immediately drew my attention. He had a colossal and heavy body; a yellow-grey face with slight stubble and no moustache… On his feet were mest [Ottoman-era shoes] and his number was written on his hat in metallic numerals… Like a monument of lament! I was petrified. I watched him until we arrived in Fındıklı. 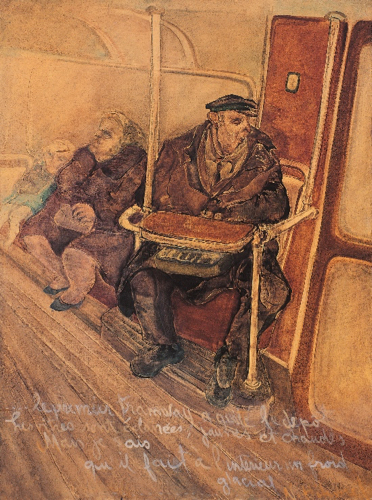 I was still gazing at him as I was getting off the trolleybus and [was thinking], ‘Oh god, I hope the exam subject will be suitable for me to draw this man.’ It was, and the painting received full marks from the jury. The 1970s marked the start of an era in which Güleryüz’s political stance would become more clearly defined, and in which he began recording the voice of the street. 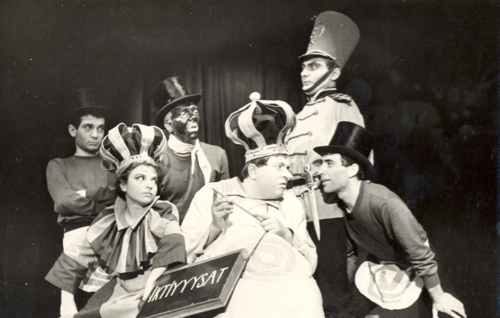 The effect of the military coup d’état in Turkey on March 12, 1971, by which time Güleryüz had already left for Paris, and the turbulent atmosphere he encountered there, emerged as compositions in which the subject and concerns about form were equally balanced. The ‘Generais’ series of drawings, for instance, depict the Jardin des Plantes seized by soldiers – but is also a symbolic condemnation of the March 12 coup. 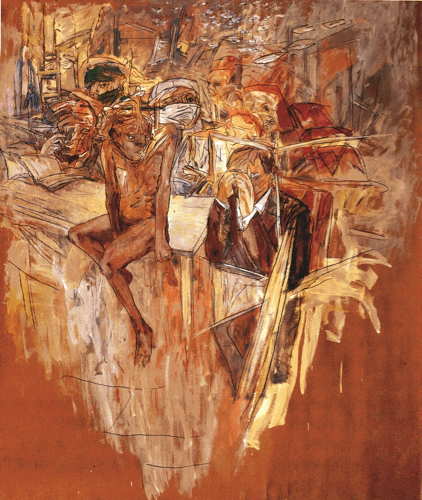 In the mid-1970s, Güleryüz returned to Istanbul and began teaching painting at the Istanbul State Academy of Fine Arts. In 1980 – the year of Turkey's next military coup d’état – he resigns from his teaching post and goes to New York, where he spends almost five years. His work is underlined even more intensely by socio-political observations and black humour, and he draws more animal figures, something he’d started to experiment with in Paris. 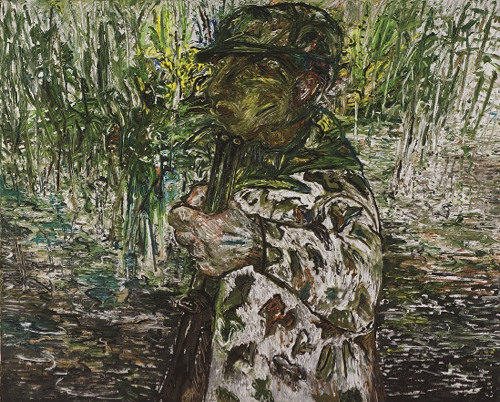 The figures in paintings such as ‘The Seamen’, ‘Hunter’, ‘The Sea Dog’ and ‘The Tree Cutters’, all from 1987–88, are defined by their titles – and invite us inside the world of the artist’s rich imagination. Presented alongside each other, the viewer is presented with a parade of the archetypes of various professions – the figures representing not only themselves but also characteristic aspects of the group to which they belong. The socio-cultural transformation Turkey experienced in the 2000s has likewise become a point of fascination for the artist, and his works from the past decade show a deeper psychological intensity. 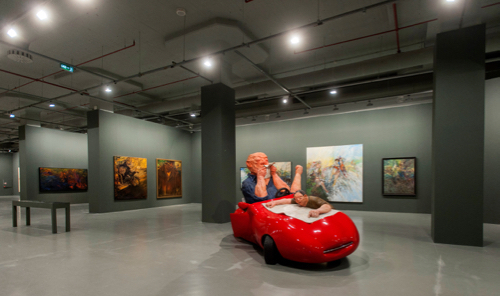 Güleryüz has produced many works using political cross-references to express the change in people’s moods. He identifies a time in which every emotion must be ‘experienced’ in an extreme manner, and in which exhibitionism and voyeurism coexist and dominate, virtually and otherwise. Modern society is dominated not by ‘display’, but by ‘exposure’, and paintings such as ‘It Envied You’, ‘You Swept Me Off My Feet’ and ‘What’s wrong with you?’, 2009–10, ask questions about the emptiness we feel in this brave new world. It’s all very powerful stuff. Unstable mental states and schizophrenia are explored in paintings such as ‘Knowingly’, ‘Unknowingly’ and ‘The Proclamation’, all from 2009. These also portray how the power structures (the government, the media) we ourselves have constructed, either knowingly or unknowingly, have turned our reality into a nightmarish existence. The figures in Güleryüz’s paintings are neither male or female, introducing a further narrative of gender politics, and the emotions they evoke are powerful – shock, discomfort, maybe disgust and even fear. Early on in his career, Güleryüz discovered the ideal material with which to maintain the tension and expression of his sculptures: papier-mâché. In the 1970s this was virtually ignored by artists, and bronze, wood and marble ruled supreme. 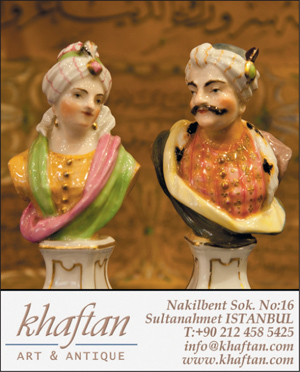 Güleryüz pioneered the use of papier-mâché in Turkey, a material which gave the medium a certain fragility. 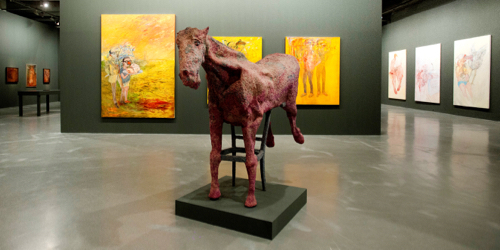 Two of Güleryüz’s sculptures particularly encapsulate his style – the sculpture of the horse (Hayber – the artist’s own horse), its skeleton constructed from used furniture, and the dog. 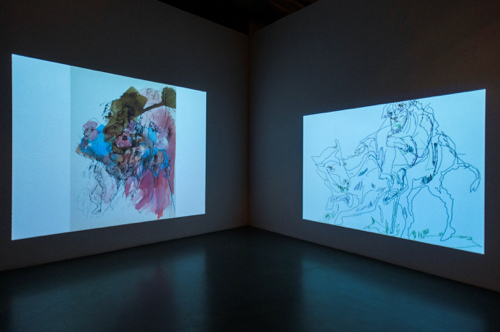 Both are scaled in size in order to establish a natural, one-to-one relationship with the viewer. The exhibition also highlights Güleryüz’s near obsession with questioning and trying to understand his inner world – with texts by the artist peppered throughout. One corner is sectioned off as a small room, with the walls covered in Güleryüz’s quotes – what it means to paint, what it means to be a painter (these come from a compilation published by the İş Bank Cultural Publications in 2014). These call to mind the artist’s previous reflection on the painter wearing many hats – that of a poet, that of a philosopher. ‘Don’t people at every age consider their own beliefs to constitute the primary truth; that which they accept and the imaginary and emotional worlds they create themselves? Don’t they rely on this common ground to insert false truth into the category of reality? Isn’t it the nature of the artistic mind to seek the truth in spite of reality?’ asks one of Güleryüz’s philosophical quotes. And that is exactly what he has spent his career doing. The exhibition continues until July 26. 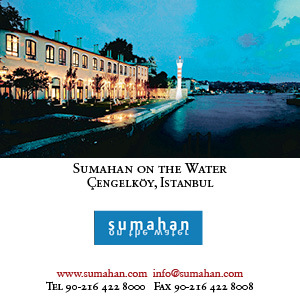 It is absolutely essential viewing for anyone who loves (or cares about) modern Turkish art. 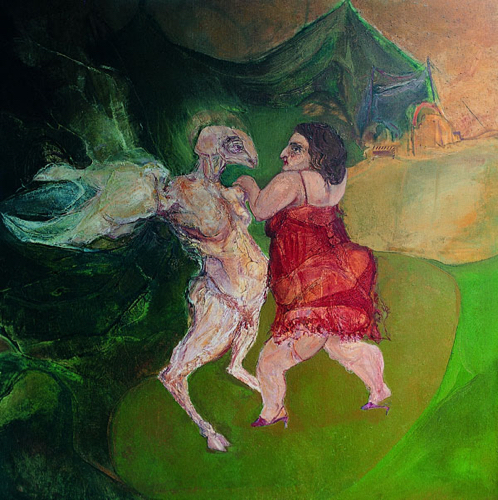 Main image shows the painting, ‘I’m Not Your Mother’, 2011, oil on canvas, 250 x 180 cm, artist’s collection.